Many congratulations to Manor School Sports College Raunds as the Midlands Regional winners of the Green Plan It Challenge, for their design project. I had the privilege of mentoring this team through the design process of their chosen project, an outdoor dining area within the school grounds, which had previously been rarely used. The team, along with their teacher, had ten weeks from the initial project launch day to measure, plan, collate ideas, draw plans and create a 3D model of a school garden. The Manor School team presented their completed model, drawn plans plant list and costings to a team of RHS assessors, who were most impressed with ideas and the level of detail in the completed report. Very well done! A presentation on the use of climbing plants and how to sort out those difficult vertical spaces facing North, South, East and West. 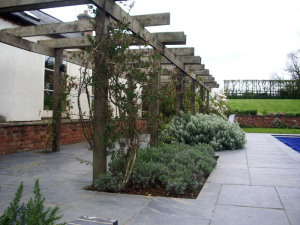 Dry shady North facing walls were thought to be the hardest to cover with colour, but the list of options was proven to be quite wide ranging. This Autumn I have joined the RHS Green Plan It Challenge, my involvement in the project has been to work as gardening mentor to the team from Manor Sports College, Raunds. I am so impressed by the enthusiasm of this school team, my job has been made so easy! This challenge was piloted last year by the RHS. It was met with such enthusiasm that it has been rolled out as a nation wide competition for schools for the first time this year. A design project for teams of students aged 11-19. RHS have invited mentors from throughout the horticulture industry, to impart a broader understanding of the industry and hopefully encourage the next generation to join and reap the rewards of a horticultural career. Amanda Banfield had the great honour of writing an article for the RHS Lily Group year book 2015-2016. 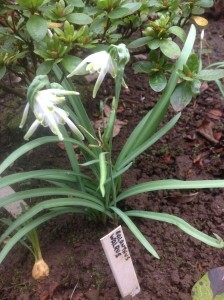 The piece was centred around the life and work of Oliver Wyatt, Northamptonshire Horticulturist, who introduced many snowdrops, including Galanthus ‘Maidwell series’, G. Limetrees, and G. Walrus. He worked tirelessly on the hybridising and promotion of lilies during the mid twentieth century, whilst also Headmaster at Maidwell Preparatory School. Thank you to Rutland Horticulture Society for kindly inviting me to talk about colour the year round in the garden. A very warm welcome was made on 7th January 2016 in Oakham. With this cold and wet weather an opportunity to share pictures of what we can look forward to in the garden for the forthcoming year. Snowdrops not far from showing their faces.